Oh I know, it looks sorta plain from the outside. It’s the best homemade present I could give my hubby for his birthday, which is today by the way. I know ya’ll want some, and it is soooo ridiculously easy to make, so give it a try. 2. Grease four 6 oz. 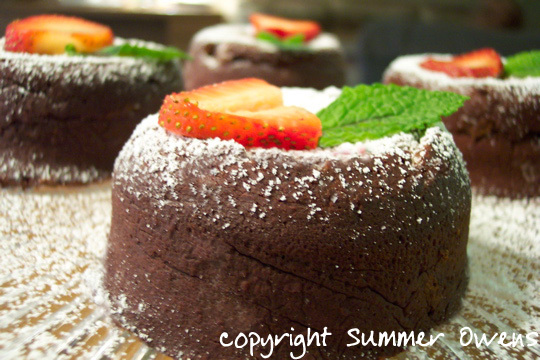 ramekins and dust with cocoa powder instead of flour. 3. In a double boiler melt the butter and chocolate, whisking every now and again till smooth. 4. Whisk in the powdered sugar and flour. It may get a little clumpy but it doesn’t need to be perfectly smooth before adding the eggs. 5. Add the three whole eggs and the additional 3 egg yolks and whisk until the mixture is smooth. 6. Pour into the ramekins and place each ramekin on your oven rack. 9. Invert each ramekin onto a plate, dust with powdered sugar and garnish if desired. Serve warm. 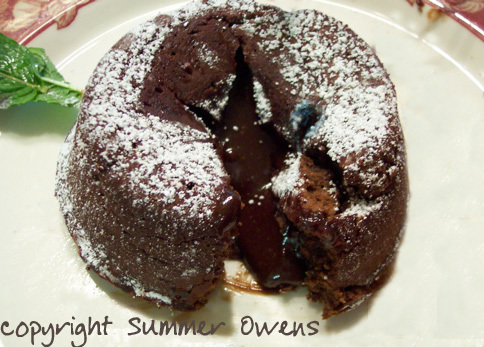 All content on Summer's Nook, unless credited to someone else by the author, is the sole property of Summer Owens and may not be duplicated without permission. The winner of American Idol is David…. While I like to visit the blogs listed below, I am in no way responsible for the content therein, nor does my linking to them mean that I agree with everything they post.